Starting in 2015, penalties will be assessed if meaningful use under the current law is not shown. The HITECH Act established programs under Medicare and Medicaid to provide incentive payments for the meaningful use of certified EHR technology. These payments will be made to eligible professionals (EPs) and eligible hospitals (EHs) as they adopt, implement, upgrade, or demonstrate meaningful use. While there has been much discussion about earning meaningful use incentive payments, it should be noted that this is not a voluntary program—only participation in the incentive program is voluntary. Every EP will be required to demonstrate meaningful use of EHRs by 2015 or face reimbursement penalties. This is not a technical program where physician groups can simply meet requirements by purchasing new technology. Imaging organizations must implement processes to effectively use and demonstrate each eligible physician’s meaningful use of EHR technology. Due to the clinical nature of EHR information, physician time and leadership will be required to develop an EHR adoption plan. An understanding of registration processes and eligibility requirements will ultimately determine whether physicians can achieve incentives. This is not a project that should be delegated solely to administrative personnel. Medicare or Medicaid EHR Program? An EP may participate in either the Medicare or the Medicaid EHR program, but not both. A Medicare EP is defined as a doctor of medicine or osteopathy who is not hospital based. A Medicare EP is considered hospital based if 90% or more of a provider’s services are performed in a hospital inpatient or emergency department setting. Program incentives are paid over five years, and each EP is eligible for up to $44,000 total or up to $48,400 if practicing in a health provider shortage area. Beginning in 2015, payments to Medicare EPs who do not successfully demonstrate meaningful use will be reduced by 1% to 5%. While practices are considering whether to pursue these incentive payments over the next few years, all Medicare EPs need to consider meaningful use compliance by 2015 to avoid the law’s payment reductions. In contrast, Medicaid EP is defined as a physician who is not hospital based but has either a minimum of 30% Medicaid patient volume or practices predominantly in a federally qualified health center or rural health center and has a minimum of 30% patient volume attributable to needy individuals. Incentives of up to $63,750 total per EP are paid over six years in the Medicaid EHR program, and there are currently no payment reductions incorporated into this program. Like all physicians, radiologists must register in order to participate in the EHR incentive program. Immediate registration is not required, but physicians will need to register before February 29, 2012, to be eligible for the 2011 incentive. The early bird doesn’t get a fatter worm, as there seems to be no clear advantage or disadvantage to early registration. The Centers for Medicare & Medicaid Services (CMS) is now providing the option for third parties to register and attest on behalf of physicians. Specific guidance can be found at http://questions.cms.hhs.gov. For groups who plan to register themselves, registration instructions can be found at www.cms.gov/EHRIncentivePrograms. Steps for successful EHR incentive program participation include determination of eligibility through the demonstration of meaningful use and registration for the incentive program through reporting. Radiologists who meet the definition of an EP are eligible to participate, but individual radiologists needs to examine their work volume to determine EHR program eligibility. Under the current definition, most radiologists meet the EP criteria. As mentioned previously, radiologists who meet the definition of an EP will not only be eligible for incentive payments through 2015 for demonstrating meaningful use but, starting in 2015, penalties will be assessed if meaningful use under the current law is not shown. Radiologists will not find it easy to meet the necessary criteria to demonstrate meaningful use of certified EHR technology and thus receive the EHR incentive bonus. The 15 core elements reveal little potential for radiologists to meet them as written based on their scope of practice, as the CMS EHR rules do not specifically address the practice of radiology in a meaningful way. In addition, hospitals appear unwilling to invest in EHR technology to support radiologists or other specialists until the CMS clarifies its rules and reporting requirements for specialist EPs. Current RIS and PACS systems are not certified as complete EHR technology, and vendors are reluctant to incorporate the features that appear to be irrelevant to the practice of radiology into their systems simply to meet certification requirements. Many are taking a wait-and-see approach until the CMS provides clear reporting instruction for specialists. So in many cases, radiologists will not be able to meet reporting requirements due to a lack of applicability to radiology in particular, unless further clarification is provided. Hospital-based radiologists would have to rely on a certified ambulatory EHR to meet reporting requirements, whereas imaging centers would need to install certified ambulatory EHR technology or potentially have their RIS systems integrate with certified technology. Will the implementation of new technology, process change, and retraining reduce the amount of time available for reading studies? The concern has been raised, and many industry experts predict reduced productivity, at least during the implementation phase. Optimistic industry observers believe EHRs will prompt the development of and support better processes that ultimately will produce a positive bottom-line impact. Most industry experts agree that initially, the costs—both direct and soft—will surpass any incentives a physician may receive. The ACR, the Radiology Business Management Association, and other specialty societies continue their efforts with the CMS to develop meaningful core elements and menu sets that are applicable and relevant to radiology. Some believe it unlikely that progress can be made in time for radiologists to qualify for the total available incentive payments. Therefore, it is important that radiologists and vendors advocate for meaningful progress in a time frame that allows radiologists to qualify for the total available incentive payments. To prepare, radiology groups can initiate some dialogue with partnering hospital(s) about their EHR plans. 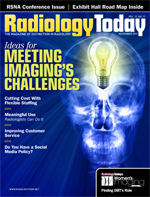 Asking questions about technology or other tools that allow radiologists to successfully report will give groups solid ground as to what is needed for program success. Groups should also discuss their EHR plans with vendors where it is applicable. • attestation of use of certified EHR technology. Registration is the first step to participating in the incentive program; whether or not a group believes it will ultimately get the incentive or not, it still must demonstrate meaningful use or in the future be prepared for monetary penalties. Preparation and planning for the EHR program will better position groups for incentives as they try to organize reporting and processes as well as take on added costs for implementation. The bottom line: To qualify for incentives, groups must always think ahead. It is important to realize that technology certification runs two tracks—either ambulatory or inpatient. Ambulatory EHR systems collect data and provide reporting specific to an EP, while inpatient EHR systems collect data and provide reporting specific to an EH. Radiologists cannot use an inpatient EHR system for reporting because it does not collect data or report on the measures for an EP. It is likely that hospitals that employ physicians will purchase two EHRs: an inpatient EHR and an ambulatory EHR. Other hospitals or those that do not employ physicians may purchase only an inpatient EHR, so it is crucial to discuss EHR plans with the hospital to verify its intent in this regard. EHR systems can be certified as complete or modular. Complete certification, as its name implies, means ready for attestation. Modular certification offers organizations the opportunity to build a complete system by choosing certified modules. Under the modular approach, an organization can select various certified modules that together meet all reporting requirements. Successful attestation requires the entry of a valid certification ID number. Software listed may be at various stages of certification completion, and packages that are in the process of becoming certified will not yet have a valid certification ID. Therefore, radiologists must not be misled as they seek certification and should not assume a product name will suffice. Modular software alone cannot achieve full meaningful use reporting. Various types of vendor software can assist users with qualifying for EHR incentives, but users cannot qualify for EHR incentive using only one product listed as modular. As noted on the CMS certified technology website, vendors listed as modular meet only a certain percentage of the EHR requirements, meaning radiologists pursuing meaningful use must select other software products that, when combined, will equate to 100% meaningful use. A certification ID is a requirement for meaningful use attestation. If an EP does not meet 100% of requirements, a certification ID will not be received. The Certified HIT Product List (CHPL) can be found at http://onc-chpl.force.com/ehrcert and provides an authoritative and comprehensive listing of complete EHRs and EHR modules that have been tested and certified under the Temporary Certification Program maintained by the Office of the National Coordinator for Health Information Technology (ONC). Each complete EHR and EHR module listed is certified by an ONC-Authorized Testing and Certification Body and reported to the ONC. Only the product versions that are included on the CHPL are certified under the ONC Temporary Certification Program. • Select the practice type by selecting either the ambulatory or inpatient button. • Search for EHR products by browsing all products or searching by product name or criteria met. • Add product(s) to the cart to determine whether the product (or combination of products) selected meets 100% of the required criteria. • Request a CMS EHR certification ID for CMS registration or attestation from the cart page. An organization can submit its module selections to the ONC for approval as a complete system and once it receives a unique complete approval number for its specific composition of modules, it can then attest using that number. Radiologists able to achieve meaningful use in 2011 must file an attestation with the CMS prior to February 29, 2012, to receive payment for 2011. Medicare EPs will have to demonstrate meaningful use through the CMS’ Web-based Medicare and Medicaid EHR Incentive Program Registration and Attestation System. In this system, providers will fill in numerators and denominators for the meaningful use objectives and clinical quality measures, indicate whether they qualify for exclusions to specific objectives, and legally attest that they have successfully demonstrated meaningful use. Once providers have completed a successful online submission through the attestation system, they will qualify for a Medicare EHR incentive payment. More information can be found at www.cms.gov/EHRincentiveprograms. EHR incentive program attestation, while not difficult, is lengthy and requires thorough documentation. Specific links can be found at www.cms.gov/EHRincentiveprograms under the attestation option. EPs should pay special attention to the Attestation User Guide for Medicare Eligible Professionals and the Meaningful Use Attestation Calculator. • The information submitted for clinical quality measures (CQMs) must have been generated as output from an identified certified EHR technology. • The information submitted must be accurate to the knowledge and belief of the EP or the person submitting on behalf of the EP, EH, or critical access hospital. • The information submitted must be accurate and complete for numerators, denominators, exclusions, and measures applicable to the EP, EH , or critical access hospital. • The information submitted must include information on all patients to whom the measure applies. The CMS considers information to be accurate and complete for CQMs insofar as it is identical to the output that was generated from a certified EHR technology. Numerator, denominator, and exclusion information for CQMs must be reported directly from information generated by certified EHR technology. By agreeing to the above statements, the physician(s) or facility attests that the information for CQMs entered into the Registration and Attestation System is identical to the information generated from said technology. The CMS does not require any additional information beyond what is generated from certified EHR technology in order to satisfy the requirement for submitting CQM information. The EHR program is permanent, and therefore all radiologists should develop an EHR plan and begin the registration and attestation process. Specialist EPs, such as radiologists, may find it difficult to attest early in the program because the first round of EHR measures does not apply specifically to specialists, which makes gathering the requisite data for successful reporting difficult. That said, radiologists should not take a wait-and-see approach but instead communicate with their hospitals and plan for implementation over the next few years to avoid penalties. Specialty associations and industry groups are working with the CMS to develop further measures more related to their specialties. To be safe, each group can and should evaluate its technology in addition to assessing its ability to successfully attest and the timeline of such; 2015 is not that far away. — Randal J. Roat, CHBME, is vice president of radiology services at Medical Management Professionals, Inc.